Since late summer 2016, a small-scale refugee crisis has been unfolding at the Belarusian-Polish border near Brest, as several thousand Chechen refugees attempt to make their way into Poland. They are mainly seeking political asylum in the EU, claiming that they are persecuted by the repressive regime in Chechnya. However, the majority fail to convince Polish border guards to allow them to enter the country as refugees. Nevertheless, many Chechen families refuse to give up and are biding their time in Brest, adamantly re-attempting to cross the border every day. Migrants and refugees have usually entered Belarus through the open border with Russia. If Belarus signs the Readmission Agreement with the EU, it will be forced to deal with illegal migrants and unsuccessful asylum seekers should Poland send them back under the terms of the agreement. The number of Chechen refugees in the EU rose in 2013, when according to Eurostat more than 40,000 Chechens applied for asylum. At that time, they did not have trouble receiving visas and travelling to Germany via Poland. However, as the refugee crisis in Southern Europe intensified in 2015, Germany forced Chechens to return to Poland, where refugee camps soon filled up. As a result, the Polish government stopped accepting refugees into the country, claiming that there is currently no war in Russia. However, this has not discouraged the streams of people fleeing Kadyrov's regime in Chechnya. Chechen cab drivers now even offer a fixed price for the itinerary Grozny-Brest: about €160 per person. According to human rights activists, those fleeing Chechnya include opponents of the regime and their relatives, torture victims, people fleeing local blood feuds, women and children under the threat of persecution, and would-be conscripts who refuse to fight in Syria or Donbass. The exact number of prospective refugees remains difficult to estimate. In 2015, Polish border services blocked 53,000 entries to Poland, while in 2016 the number grew to 118,000. However, these statistics only indicate the number of failed attempts to cross the border. As Russian citizens, Chechens are allowed to stay in Belarus for up to 90 days. However, their ultimate goal is the EU, as Belarus has never been an attractive destination for migrants. The majority of Chechens do not consider the country safe, fearing its open border with Russia. What's more, not a single Russian citizen has ever been granted asylum in Belarus. By late summer 2016, between 1,000 and 3,000 Russian citizens from Chechnya and other parts of the North Caucasus were stuck in Brest, seeking asylum in the EU as political refugees. Every day, hundreds boarded the Brest-Terespol regional train in the hopes of obtaining refugee status in Poland. However, only one or two families have been successful so far. All others return to Brest, only to repeat the attempt the next day. By winter, the number of asylum seekers had gone down, but many Chechens still remain in Brest. Human rights activists from the Belarusian NGO Human Constanta note that Polish border control treats refugees with contempt, accusing them of being economic migrants or terrorists. Officers often spend less than a minute with potential refugees and force them to board the return train before they can even plead their case. 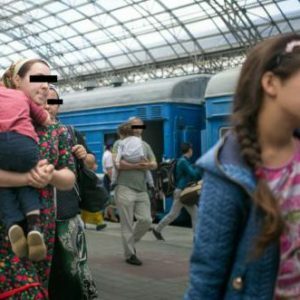 During the summer of 2016, entire Chechen families were living at the railway station in Brest. Those courageous enough to remain in Brest for winter moved to overcrowded rental apartments in the vicinity of the station, from where they would continue to try their luck until money ran out. Every attempt to cross the border by train costs a family about €50, including tickets and daily expenses. The Belarusian Ministry of the Interior does not see significant problems with the refugee situation. The summary report for 2016 described the migration situation in Belarus as 'stable and controlled.' At the same time, it acknowledged the fact that illegal migrants were using Belarus as a transit country on their way to the EU. Popular reactions to the Chechen presence in Brest range from callous to business-like. As the Chechens' only goal is getting into Poland, locals do not see them as competition. Brest landlords also profit from signing daily leases to rent apartments and rooms to Chechen families. In protest against the arbitrariness of the Polish border patrol vis a vis the Chechens camping in Brest, in August 2016 Human Constanta set up a special mission in the city. Volunteers collected donations for the children and provided legal aid to the refugees, drawing attention of the media and international organisations to the plight of the Chechen refugees. Together with Polish NGOs, Belarusian volunteers collected over 20,000 signatures in support of the Chechen refugees. They demanded that Poland fulfil its international obligations to guarantee the rights of refugees. However, civil society has had only partial success. Arbitrariness at the border continues, and those without a valid Schengen visa can only hope that one day their daily commute between Brest and Terespol will be successful. In February 2017, the Polish Ministry of the Interior and Administration announced changes in regulations concerning admittance of refugees. New regulations would simplify deportation process and create a legal basis for denying entry to potential refugees. According to dziennik.pl, Poland would like to cooperate with Belarus in order to create special facilities for the refugees on Belarusian territory. Thus, asylum seekers could await decisions on their applications from outside of Poland. In January 2017, the EU promised to fund construction of facilities for migrants in Belarus within the framework of the EU-Belarus Mobility Partnership Programme. This would help Belarus cope with illegal migration and support its commitment towards signing the Readmission Agreement. This agreement would facilitate deportation of individuals who had entered the EU illegally from Belarus. The Belarusian side has signalled that it is ready to sign. Nevertheless, it continues to hesitate, hoping to convince the EU to allow for a transitional period before full implementation of the agreement. The signing of the agreement is a crucial precondition to simplify visa regulations for Belarusian citizens. However, it would also mean that Belarus would need to deal with unsuccessful illegal migrants to the EU, instead of simply observing their attempts to cross the border into Poland and ignoring their plight. Can anger sustain the Belarusian protests? 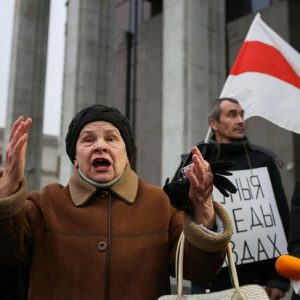 On 17 February of this year, Minsk saw the largest civic protest since 2010, when demonstrators gathered in the capital to protest the results of the presidential election . However, this recent demonstration of ‘angry Belarusians’ was significantly different from most other Belarusian protests. This time, rather than the conventional crackdown, the Belarusian government opted not to break up the protests. It is possible that the authorities permitted the demonstrations because they recognised their mistake in instituting the controversial 'social parasites' law and are looking for an elegant way to abolish it. Most Belarusian protests have traditionally been against the government. However, demonstrations with socioeconomic aims tend to attract more people. The largest protest in the history of independent Belarus occurred in 1991, when more than 100,000 people gathered in Minsk to protest economic and social decline. Later, in 2006 and 2010, Belarusians protested against election results, although the demonstrators’ numbers never exceeded 50,000 people. The most recent demonstrations, against the decree on ‘social parasitism’, took place on 17-19 February and attracted a total of around 5,000 people. The law requires unemployed citizens who spend at least 183 days a year in Belarus to pay a €220 tax. Representatives of the opposition have participated in every protest and aim for maximal visibility and leadership during street demonstrations. During political protests, the opposition has formulated the main demands and guided demonstrations. During social protests, the opposition has tried to include their own demands in the general protest agenda. Immediately following its introduction, the ‘social parasite’ decree sparked heated debate among Belarusians. 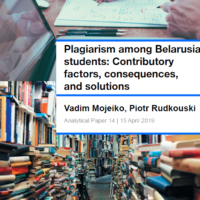 Beginning in social media, Belarusians expressed anger at this infringement of their rights. Citizens created numerous petitions and sent appeals to the Ministry of Tax. They also protested by refusing to pay. According to the latest data, only 54,000 of 470,000 people have actually paid the tax so far. Aliaksandr Siamionaŭ, a resident of Homiel, became the first person to file a court claim stating that the decree violates his constitutional rights. However, the day before the hearing, Siamionaŭ received a job proposal and a notification that he was no longer obliged to pay the tax, and on 21 February the court closed the case. During the hearing, more than 200 people supported Siamionaŭ in front of the court. The protests were a culmination of the fight against the decree. Despite initial prohibitions by local authorities, protests took place in the six largest Belarusian towns. The state-controlled media portrayed the protests as an attempt by the opposition to use this window of opportunity to increase their support. As Belarus Segodnya wrote, 'The state has no right to yield to the "protests" of noisy groups who came to demonstrations because of the calls of oppositional politicians, who see an opportunity to fish in troubled waters'. Opposition leaders themselves have apparently failed to present themselves as a united body heading the protests. Some oppositional leaders, such as representatives of Movement for Freedom, Belarusian National Front, United Civic Party, were not even present at the demonstrations. They predicted that the demonstrations would be too modest for them to risk compromising their image. However, Niakliajeŭ and Statkievič took a chance and stepped up as strong leaders for the demonstrators. While the majority of previous demonstrations had used only political slogans, such as simply 'Go away', the protests of 17-19 February had particular economic demands and were able to mobilise more social groups. For the first time in a while, large leaderless groups and citizens without any party affiliation joined the protests. National themes and calls for a regime change were secondary. The protests also provoked debate about whether they could became a way for Russia to destabilise the country, send troops in, and 'protect' people who ask Russia to save Belarus, as happened in Ukraine. Nevertheless, many experts believe that such a scenario is highly unlikely. As Valieryj Karbalievič stated on Radyjo Svaboda: 'Given the current situation in Belarus…pro-European forces are stronger, better organised, and more politically mature than pro-Russian ones…It’s hard to imagine a pro-Russian Maidan here'. Law enforcement has become an increasingly common way to deter potential protestors and crack down on demonstrations. In 2006, the police detained hundreds of protesters after demonstrations against the results of elections held on 19-25 March. Post-election protests in 2010 ended in almost 1,000 Belarusians being repressed. Police brutality and repression have become a predictable part of any protest in Belarus. However, this time the authorities deemed the use of violence undesirable. If the authorities had behaved the way they normally do, they would have had to imprison not only members of the opposition but also those who trust the government. Predicting possible conflict with Russia, the authorities might also be seeking to increase the number of citizens who are loyal to the current regime. A crackdown on oppositional demonstrations would hardly surprise anyone, but suppression of social protests could cause more resentment. In ignoring the protests, the authorities also seem to be seeking the best way to abolish the decree. Several days before the protests, the authorities realised that demonstrations could occur and attract large numbers of people. They organised special meetings for citizens with government representatives in order to 'clarify' the meaning of the decree in an attempt to avert protests. The authorities are most likely willing to abolish the decree but are afraid that this could be taken as a sign of weakness. On 17-19 February, Belarusians gathered to articulate their position against the government's decision in a massive demonstration. The political opposition received a chance to get closer to ordinary Belarusians by helping them stand up for their rights. The demonstration of 25 March should, for this reason, focus on the economic demands which are the people's primary concern. If the authorities abolish the law, oppositional leaders will be perceived as successful defenders of civil rights and receive more support. If the law remains, the protest activities of Belarusians will only grow, along with support for the opposition. Thus, no matter the outcome, the Belarusian opposition will benefit from the ‘social parasite’ decree. The amount of angry Belarusians will grow; this could later create a more lasting atmosphere of protest, making demonstrations more powerful. Demonstrations can achieve their objectives when a significant amount of people are ready to support both economic and political aims. The difficult economic circumstances preceding the protests jeopardise trust in the government among large swathes of the population. The social character of the protests also decreases the chances of a crackdown, and opens more space for citizens. For now, it looks as if Belarusians are becoming less afraid of protests. They just need a proper impetus to express the 'anger'.